“Go with the rhythm! Hyper Ping Pong” is a quirky Japanese video game that allows you to play table tennis without a table, a ball or an opponent. Following in the footsteps of Nintendo – inventors of the popular Wii console – Japanese game developer, Happinet, has decided to take things one step further and take the video out of video-game. They’ve come up with a table tennis game that only features a motion sensor racket that emits the sound of a ball being hit by the invisible opponent. Players must find their rhythm and time their hits to the sound to continue their rally. By pressing the square button on the paddle, they can do a Smash, and if performed with perfect timing, it turns into a rally winning Super Smash. According to Atsushi Watanabe, from Happinet, you can play Hyper Ping Pong, by yourself, in your room, but also at parties, to show people just how well you can rally. As the game progresses, the rally will make everyone more excited, making the game more enjoyable for everyone. Right… I think a YouTube commenter said it best: this game was invented for people who love ping pong but have no friends whatsoever. 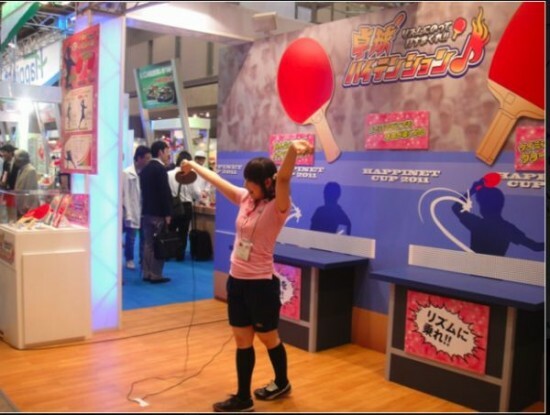 Happinet will officially release Hyper Ping Pong in October, for approximately ¥2,000 ($25).